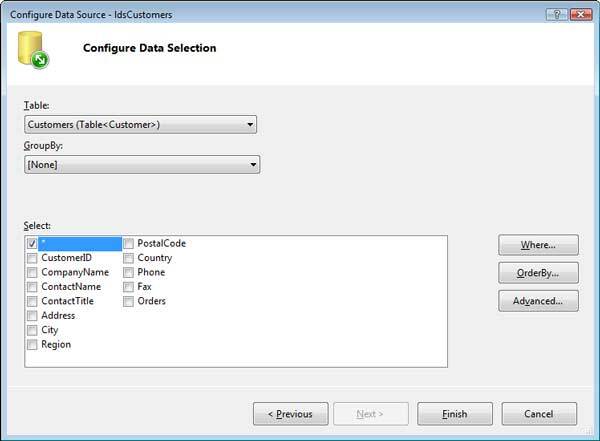 Speed O/R Mapping with LINQ to SQL: Figure 4: Configure ASP.NET's LinqDataSource Component. LINQ to SQL's dedicated LinqDataSource component substitutes for the DataSet's SqlDataSource and delivers server-side sorting and paging, as well as parameterized T-SQL commands for create, retrieve, update, and delete (CRUD) operations. Optionally, you can specify stored procedures as CRUD methods. To be updatable, all EntityType properties must be selected; substituting a LINQ projection for an EntityType results in a read-only data source.